One week ago we celebrated Fourth of July as a nation. 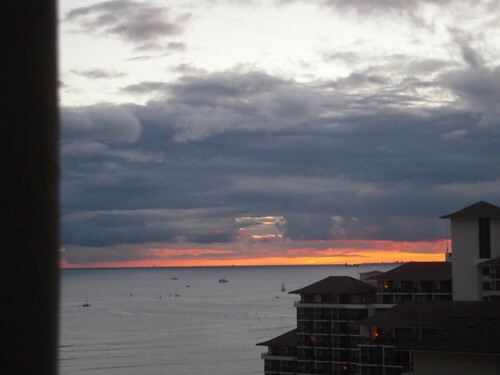 I was attending a conference on Oahu, staying in a hotel on Waikiki. I had a ring-side seat to the fantastic fireworks display. Waiting for the big event, I watched the sun drop down behind the horizon, something we all seem to love – and there’s nothing quite like a sunset on Waikiki. I was able to get a short video on my little Nikon CoolPix camera. It may be a little blurry or shaky, but in case you missed the fireworks somewhere else, you can watch this YouTube. 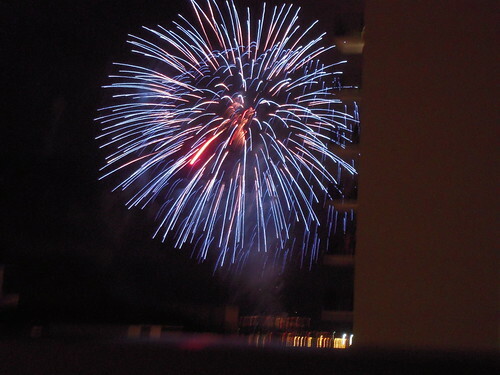 Pretend you are sitting with me on the balcony of my hotel on beautiful Waikiki Beach! Good ringside seat, Lucy! We heard a couple of firecrackers go off and not much else….it was quite quiet in our hood! This past week has been a real treat for me! A whole week in Waikiki! Watch for Thursday’s post! 🙂 Now if I can just remember my brother’s trick for keeping the camera from jiggling! Previous Previous post: HAPPY 4th OF JULY!! !